Since my selected poems about women, ‘be an angel’ was published in 2017, I have published a revised edition of ‘Storm Biscuits’. It was originally published in 2001 since when I have written many more poems about the island of North Uist so most of these now appear in the new edition. ‘Written on the Shore’ has been a work in progress during the last two years. It is a sequence of poems originally scribbled in my notebook during my long walks on my favourite Sollas Beach. The overarching theme is one of relationships, real or imagined. 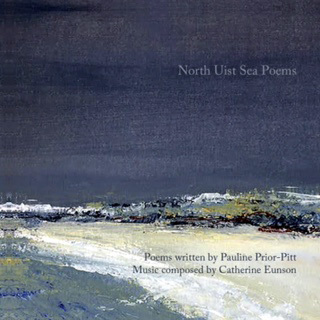 CD which goes with my pamphlet, North Uist Sea Poems. The music was composed by Catherine Eunson for cello, flute, fiddle, harp and my speaking voice. It beautifully evokes the sea and the shore in all its moods. Poetry in the Barn, an all day event with Pauline Prior-Pitt, Gillian Clarke, Jonathan Edwards, Paul Henry, Deb Alma ( the emergency poet, Jean Atkin, Thirza Clout and Jenny Swan. Aardvark Books, Brampton Bryan, Nr.Knighton Shropshire. An Island Launch for two new collections. September 2nd – 16th Pop Up Art Gallery and Cafe at Tigh Sgire. My paintings and books will be on sale. November 20th Reading with the JAZZ pianist, Luke Barlow at Cafe Brioche in West Hampsted, London. November 25th Reading at The Bakehouse, Gatehouse of Fleet. Lovely to be invited back for a third visit. 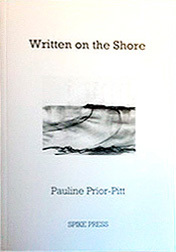 “be an angel” is a selected works bringing together many of Pauline’s poems about being a woman. Alternately funny and poignant, they beautifully reflect the preoccupations of a woman’s life, covering birth, death, and everything in between – including the mysterious relationship between men and crumbs. New Book “be an angel” is ready to launch on June 1st at Taigh Sgire Sollas at 7.30pm. Everyone welcome. 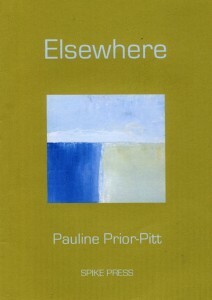 Just to let you know that my new poetry collection “ELSEWHERE”, pub SPIKE PRESS, will be coming out in the next couple of weeks. The Island launch will be on Thursday May 23rd at Taigh Chearsabhagh, North Uist, at 8pm. Everyone who would like to be there is invited to come.